Western Blot Buffers | Chondrex, Inc. Traditional western blot buffers (BSA, Casein, NGS) provide an economical method for increasing the signal to noise ratio in a western blot. Many proprietary western blot buffers are more costly than these methods, but provide substantial blocking effects. 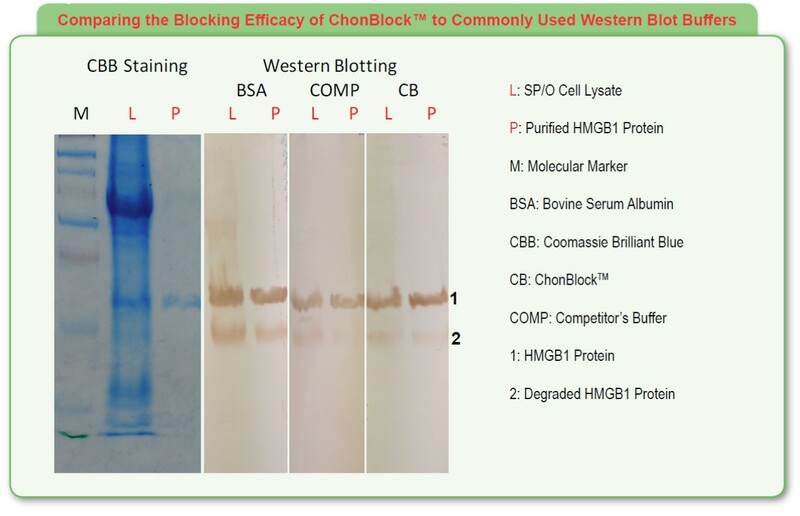 ChonBlock™ is a new western blot buffer that proves to be as efficacious as other proprietary buffers, but at a cost-effective price. A western blot was run using a 15% poly-Acrylamide gel under reducing conditions to compare three different buffer systems. Mouse Anti HMGB1 monoclonal antibody (Clone 1-1.2BP1) was used as a primary antibody at 1 µg/ml, and goat anti-mouse IgG antibody conjugated with HRP was used as a secondary antibody at a 1/4000 dilution. A non-specific smear signal was observed in the BSA-Tween buffer due to the lack of blocking effect. On the other hand, a competitor’s buffer prevented non-specific smearing, but showed a weak signal with high background color. In contrast, a distinct HMGB1 band with low background was observed using ChonBlock™.